AARP Blog: What's Happened to Housing Affordability? I wrote my first solo post for the AARP Public Policy Institute blog yesterday, "What's Happened to Housing Affordability." Those of you that are regular readers of DrUrbanPolicy may remember that I first wrote about the different perspectives on housing affordability in "'Housing's Back' Or is it? Understanding Measures of Housing Affordability" back in January when the National Association of Realtors released their Housing Affordability Index results for the last year. As in my earlier post on DrUrbanPolicy, I focus in on the difference between the NAR definition of "housing affordability" and my own.One thing that has troubled me through the years is that many people think of "affordability" at the initial time of purchase, but they then ignore the month-to-month costs down the road. As the chart below shows, a higher percentage of homeowners and renters are "housing-cost burdened" than at the beginning of the century. A household is housing cost burdened if they pay so much for housing that they are at risk of not being able to afford that housing, particularly if a life change happens that makes it harder to pay rent, mortgage or other housing costs. These changes could include a health incident, reduction in work hours, spike in energy prices, etc. It's hard to predict the future, but it's even harder to deal with it if one has no cushion in his or her budget. The path to both of these started from work that was done for AARP's State Housing Profiles project - we looked at a range of housing data for the population age 50 and older in each state, and it struck me that housing costs were going up for people in every income group and for homeowners and renters. This led to two AARP Public Policy Institute reports: A brief discussion of affordability in a paper that covered a range of housing issues for the the general population "Housing for Older Adults: The Impacts of the Recession" and later, a paper for the Middle Class Security Project focusing on housing affordability and middle income older adults, "Loss of Housing Affordability Threatens Financial Stability for Older Middle Class Adults." I talk about the issue of declining affordability in almost every speech that I give, and many audiences are still surprised to hear that this is happening. 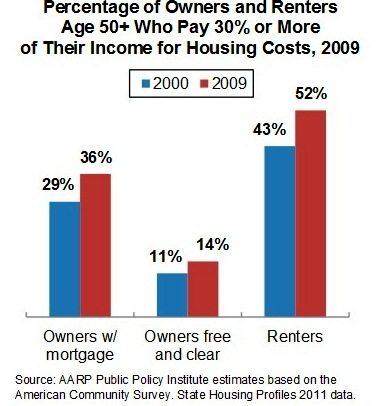 It's not jus the population 50 and older - my friends over at the Center for Housing Policy just released their updated annual Housing Landscape Report for 2013, and found that severe housing cost burden have risen for working families over the past few years. I'm glad to give this issue more visibility on the AARP blog: the NAR and other groups have every right to focus on homeowners and look at affordability at the time of purchase, but all homeowners, renters and policymakers should be conscious of affordability on an ongoing basis. Housing is not a one-time expense. 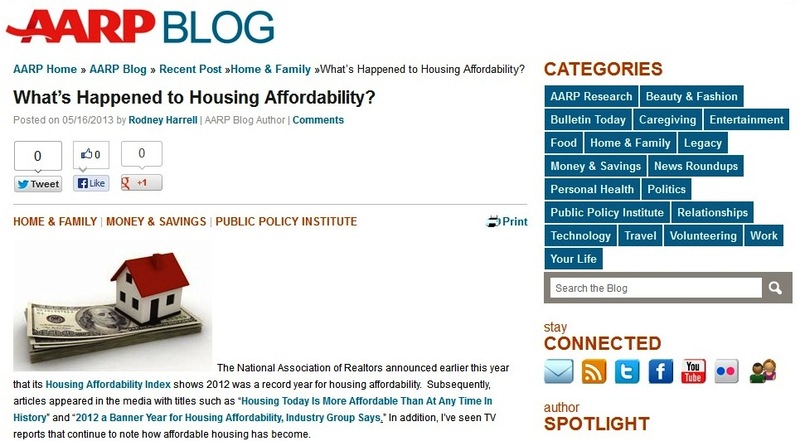 Read the AARP blog post "What's Happened to Housing Affordability," share it with others, and "like" and "+1" it if you think that the issue of housing affordability is an important one (This is a separate process from liking and sharing of this essay on DrUrbanPolicy.com). If you have comments, I'd love to hear them below or on twitter @DrUrbanPolicy.